We​ ​ made​ ​ a ​ ​ total​ ​ of​ ​ 213​ ​ VFX​ ​ shots​ ​ for​ ​ the​ ​ serie​which​ ​ represent​ ​ 40​ ​ minutes​ ​ of​ ​ VFX. 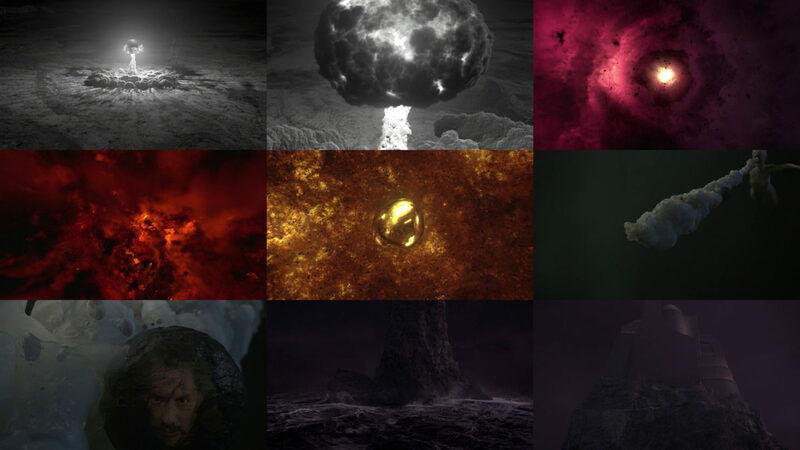 Our work was very various, from green screen extraction to an abstract ride inside a nuclear explosion, via a rejuvenation of Laura Palmer​ ​ and​ ​ a ​ ​ Frogmoth. 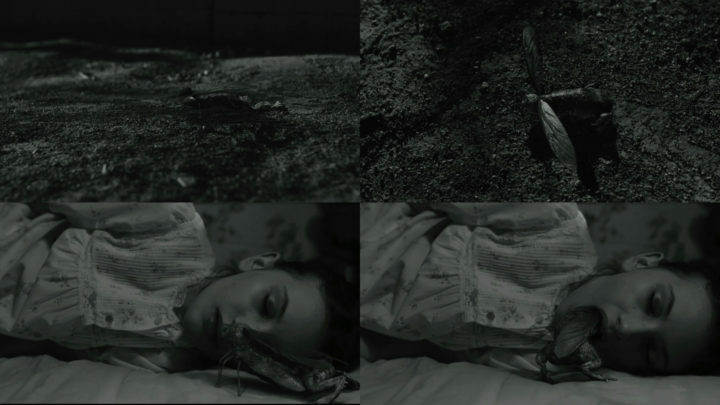 In​ ​ all​ ​ cases,​ ​ it​ ​ was​ ​ a ​ ​ really​ ​ creative​ ​ process​ ​ through​ ​ the​ ​ ideas​ ​ of​ ​ David​ ​ Lynch. 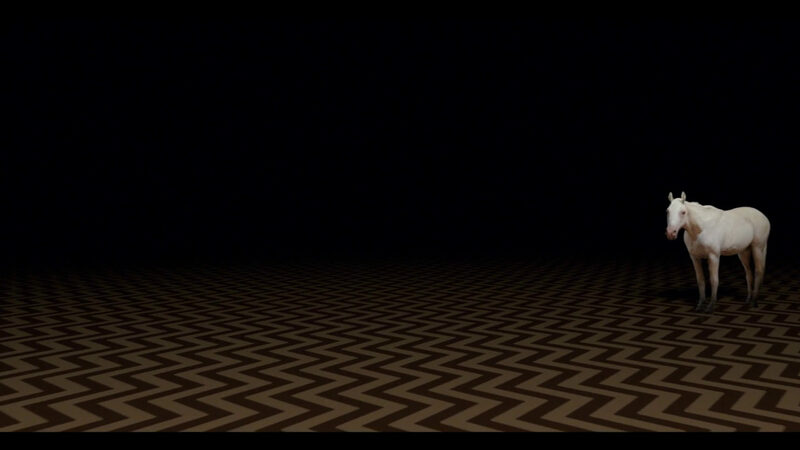 As we only had general briefs from David Lynch, due to the confidentiality of the project, the design and research part of the project was​ ​ the​ ​ most​ ​ and​ ​ the​ ​ main​ ​ moment. We had to make 2 types of face opening. The first one with Laura needed a white bright light. The second one with Sarah Palmer needed a black and fleshy color. 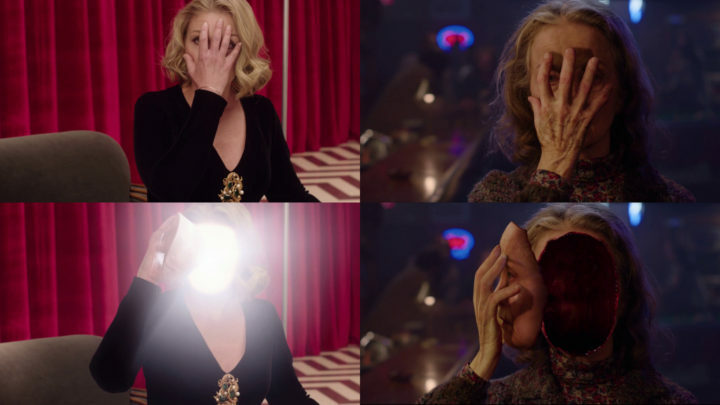 (Later, Lynch also added​ ​ a ​ ​ creature​ ​ inside​ ​ Sarah’​ ​ face​ ​ opening.) To build this effect, we needed to recreate a CG head and a CG hand based on the filmed references in order to rotoscope the​ ​ animation. 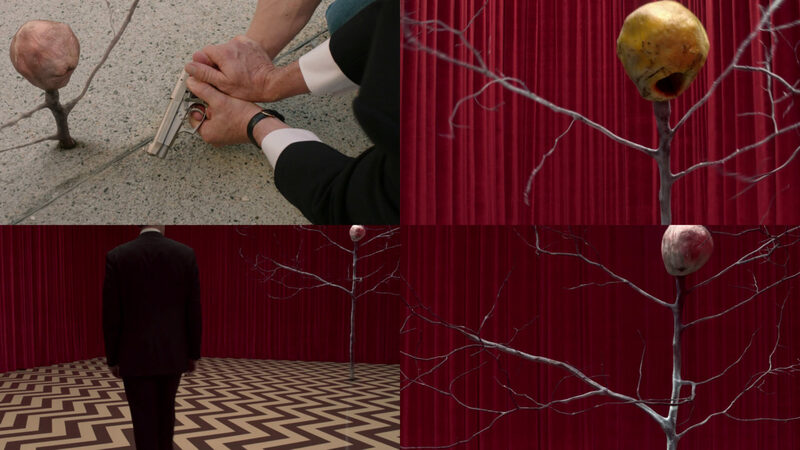 For these 2 shots, we needed to recreate a CG white horse, similar​ ​ to​ ​ the​ ​ one​ ​ in​ ​ the​ ​ previous​ ​ seasons​ ​ of​ ​Twin​ ​ Peaks. We found an albino horse in South East of France to take some reference pictures for the textures and videos for the animation of the ears and tail. The modeling was based on the references from​ ​ the​ ​ previous​ ​ seasons. 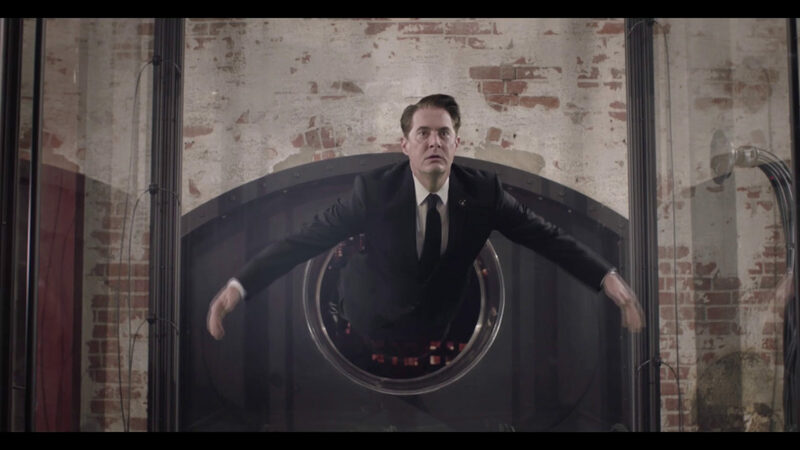 In this sequence, Cooper falls on a Glass Box, hanged on a building in New York, then he “goes” inside the box and floats inside​ ​ the​ ​ building.​ ​ We​ ​ just​ ​ did​ ​ the​ ​ part​ ​ inside​ ​ the​ ​ building. For this effect, we had two shots. A first one for the background, a second one on a green screen with Cooper floating. 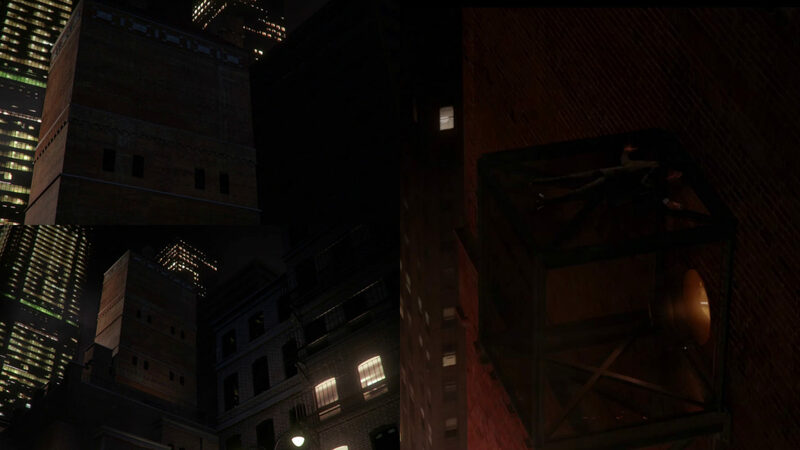 Our work consisted in cleaning up the shot of Cooper with wires and restore the suit to remove the pleats on the jacket and on the pants, but above all, we needed to stabilize the green screen shot as it was shot 4 months after the background in order to match​ ​ the​ ​ camera​ ​ movement​ ​ of​ ​ the​ ​ background. We created a CG building and environment of New York to introduce​ ​ the​ ​ position​ ​ of​ ​ the​ ​ Glass​ ​ Box​ ​ where​ ​ Cooper​ ​falls. We​ ​ created​ ​ a ​ ​ generic​ ​ CG​ ​ asset​ ​ for​ ​ the​ ​ ocean.​ ​ The​ ​ brief​ ​ was​ ​ to create​ ​ a ​ ​ black​ ​ and​ ​ calm​ ​ sea​ ​ with​ ​ a ​ ​ sky​ ​ similar​ ​ to​ ​ a ​ ​ violet​ ​ bubble. 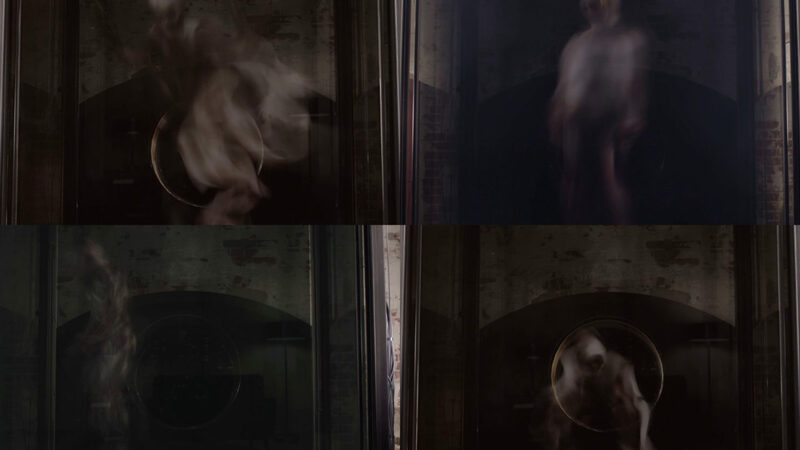 In this sequence, Dougie changes, morphs, gets distorted until disappearing. We worked on the beginning with the hand becoming really small,​ and​​ the​​ shoulders​ starting​ ​ falling​ ​ with​​ a simple​ ​ 2D​ ​ effect. 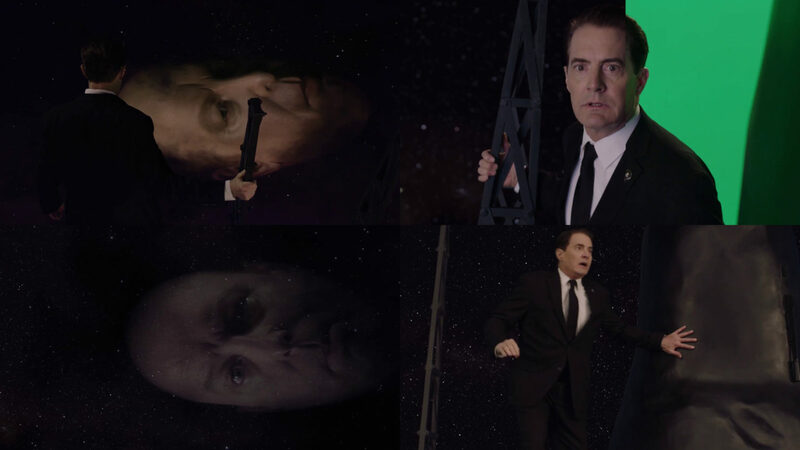 This sequence shows Cooper standing with Naido on a Black Box​ ​ floating​ ​ in​ ​ space.We had to do trackings, green screen extractions and wiresremoval​ ​ ​ for​ ​ each​ ​ shot​ ​ from​ ​ this​ ​ sequence.The main challenge was to recreate a CG head of Major Briggs,who says “Blue Rose” while moving from right to left through dark clouds and stars. As the actor Don S. Davis died in 2008,and as David Lynch wanted the same face (but stretched and a bit transparent) as in the two first seasons of the show, we just had pictures from this period to recreate the full head and animate​ ​ it. 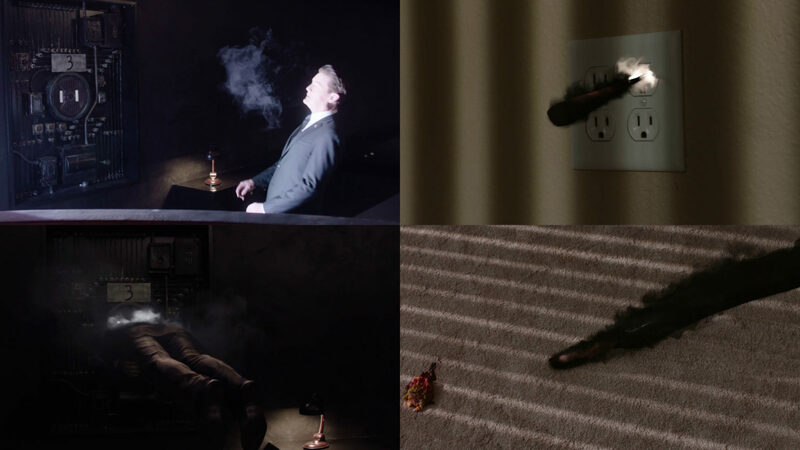 These​ ​ 12​ ​ shots​ ​ were​ ​ separated​ ​ in​ ​ 3 ​ ​ sequences.​ ​ The​ ​ first​ ​ one where​ ​ Cooper​ ​ is​ ​ attracted​ ​ by​ ​ the​ ​ socket,​ ​ the​ ​ second​ ​ one​ ​ where Cooper​ ​ is​ ​ deformed​ ​ and​ ​ sucked​ ​ into​ ​ the​ ​ power​ ​ socket,​ ​ the​ ​ third one​ ​ where​ ​ Cooper​ ​ comes​ ​ out​ ​ of​ ​ a ​ ​ power​ ​ socket​ ​ as​ ​ a ​ ​ tube​ ​ and finally​ ​ takes​ ​ shape​ ​ of​ ​ his​ ​ real​ ​ body. The​ ​ first​ ​ idea​ ​ was​ ​ to​ ​ stretch​ ​ the​ ​ head​ ​ and​ ​ the​ ​ body​ ​ to​ ​ get​ ​ it “sucked”​ ​ by​ ​ the​ ​ socket.​ ​ Finally​ ​ this​ ​ effect​ ​ was​ ​ too​ ​ comical​ ​ for Lynch,​ ​ and​ ​ he​ ​ decided​ ​ to​ ​ add​ ​ smoke​ ​ on​ ​ Cooper​ ​ as​ ​ he’s​ ​ being deformed​ ​ and​ ​ sucked​ ​ into​ ​ the​ ​ socket.As​ ​ Cooper​ ​ rematerializes​ ​ in​ ​ the​ ​ last​ ​ sequence,​ ​ we​ ​ also​ ​ see some​ ​ smoke​ ​ covering​ ​ him​ ​ and​ ​ finally​disappearing​ ​ and revealing​ ​ his​ ​ body. electricity,​ ​ but​ ​ screaming​ ​ with​ ​ its​ ​ mouth​ ​ wide​ ​ open. As​ ​ Tree​ ​ had​ ​ to​ ​ speak​ ​ on​ ​ some​ ​ shots,​ ​ Lynch​ ​ sent​ ​ us​ ​ some filmed​ ​ footage​ ​ of​ ​ his​ ​ mouth​ ​ so​ ​ we​ ​ could​ ​ match​ ​ to​ ​ his​ ​ lips movement.​ ​ We​ ​ created​ ​ a ​ ​ system​ ​ that​ ​ enabled​ ​ to​ ​ report automatically​ ​ the​ ​ lips​ ​ movement​ ​ via​ ​ optical​ ​ flow,​ ​ and​ ​ used​ ​ the texture​ ​ from​ ​ Lynch’​ ​ lips. - We​ ​ start​ ​ with​ ​ a ​ ​ wide​ ​ shot​ ​ on​ ​ a ​ ​ CG​ ​ nuclear​ ​ explosion happening​ ​ in the​ ​ middle​ ​ of​ ​ a ​ ​ desert​ ​ environment,​ ​ ​ then​ ​ camera​ ​ comes​ ​ closer​ ​ to the​ ​ mushroom​ ​ cloud​ ​ and​ ​ we​ ​ enter​ ​ inside​ ​ it. - As​ ​ we​ ​ enter​ ​ into​ ​ the​ ​ cloud,​ ​ we​ ​ follow​ ​ an​ ​ edit​ ​ composed​ ​ of​ ​ many abstract​ ​ explosions.​ ​ We​ ​ made​ ​ several​ ​ tests​ ​ on​ ​ many​ ​ themes (smoke,​ ​ fire,​ ​ dust,​ ​ bubbles...)​ ​ so​ ​ that​ ​ Lynch​ ​ could​ ​ make​ ​ a selection​ ​ for​ ​ his​ ​ edit.​ ​ ​ This​ ​ part​ ​ ends​ ​ by​ ​ arriving​ ​ into​ ​ a ​ ​ gas​ ​ station (we​ ​ didn’t​ ​ work​ ​ on​ ​ this​ ​ part,​ ​ this​ ​ is​ ​ an​ ​ edit​ ​ done​ ​ by​ ​ Lynch). - We​ ​ then​ ​ enter​ ​ into​ ​ the​ ​ gas​ ​ station​ ​ and​ ​ arrive​ ​ in​ ​ a ​ ​ milky environment.​ ​ We​ ​ discover​ ​ a ​ ​ strange​ ​ floating​ ​ CG​ ​ creature​ ​ with reversed​ ​ thumbs,​ ​ spitting​ ​ a ​ ​ solid​ ​ liquid,​ ​ eggs​ ​ and​ ​ finally​ ​ a ​ ​ black orb​ ​ with​ ​ Bob​ ​ character​ ​ (created​ ​ for​ ​ the​ ​ final​ ​ scene)​ ​ inside​ ​ it. - We​ ​ then​ ​ go​ ​ back​ ​ into​ ​ an​ ​ abstract​ ​ bright​ ​ world,​ ​ and​ ​ we​ ​ see​ ​ a golden​ ​ orb,​ ​ floating​ ​ in​ ​ the​ ​ middle​ ​ of​ ​ a ​ ​ bright​ ​ environment​ ​ and particles.​ ​ We​ ​ pop​ ​ into​ ​ this​ ​ orb​ ​ and​ ​ arrive​ ​ into​ ​ the​ ​ next​ ​ part. - It​ ​ starts​ ​ with​ ​ endless​ ​ red​ ​ particles​ ​ above​ ​ a ​ ​ violet​ ​ CG​ ​ sea.​ ​ Lynch didn’t​ ​ want​ ​ the​ ​ sea​ ​ to​ ​ be​ ​ realistic​ ​ or​ ​ have​ ​ a ​ ​ real​ ​ physical​ ​ force. After​ ​ some​ ​ time,​ ​ we​ ​ approach​ ​ a ​ ​ CG​ ​ rock​ ​ with​ ​ crashing​ ​ waves​ ​ and a​ ​ CG​ ​ factory​ ​ on​ ​ it.​ ​ The​ ​ rock​ ​ had​ ​ to​ ​ look​ ​ gigantic,​ ​ with​ ​ just​ ​ a ​ ​ small slot​ ​ on​ ​ the​ ​ upper​ ​ side​ ​ of​ ​ the​ ​ house.​ ​ We​ ​ imagined​ ​ this​ ​ building based​ ​ on​ ​ sketches​ ​ sent​ ​ by​ ​ Lynch,​ ​ and​ ​ made​ ​ several​ ​ proposals for​ ​ the​ ​ design​ ​ before​ ​ approving​ ​ the​ ​ final​ ​ look. The​ ​ scene​ ​ ends​ ​ as​ ​ we​ ​ enter​ ​ into​ ​ a ​ ​ small​ ​ slot​ ​ in​ ​ the​ ​ wall. - First,​ ​ we​ ​ had​ ​ to​ ​ comp​ ​ the​ ​ background​ ​ and​ ​ the​ ​ Fireman character​ ​ plate​ ​ shot​ ​ separately​ ​ on​ ​ green​ ​ screen,​ ​ in​ ​ order to​ ​ make​ ​ him​ ​ float​ ​ in​ ​ the​ ​ air. - The​ ​ main​ ​ challenge​ ​ in​ ​ this​ ​ scene​ ​ was​ ​ creating​ ​ a dreamy “vision”​ ​ coming​ ​ from​ ​ Fireman’s​ ​ face.​ ​ Based​ ​ on​ ​ a ​ ​ drawing received​ ​ from​ ​ Lynch,​ ​ we​ ​ had​ ​ to​ ​ create​ ​ a ​ ​ moving​ ​ image composed​ ​ of​ ​ golden​ ​ particles,​ ​ forming​ ​ little​ ​ by​ ​ little​ ​ and finally​ ​ creating​ ​ the​ ​ desired​ ​ pattern.​ ​ We​ ​ had​ ​ a ​ ​ lot​ ​ of exchanges​ ​ with​ ​ Lynch​ ​ to​ ​ finalize​ ​ the​ ​ look​ ​ and​ ​ movement of​ ​ the​ ​ particles. - When​ ​ the​ ​ image​ ​ is​ ​ finally​ ​ formed,​ ​ we​ ​ see​ ​ a ​ ​ golden​​ orb coming​ ​ out​ ​ of​ ​ a ​ ​ hole.​ ​ For​ ​ this​ ​ part,​ ​ we​ ​ created​ ​ a ​ ​ CG​ ​ orb. We​ ​ made​ ​ various​ ​ tests​ ​ to​ ​ find​ ​ the convenient​ ​ look​ ​ for​ ​ the color,​ ​ reflection,​ ​ transparency,​ ​ etc. - On​ ​ 3 ​ ​ shots,​ ​ we​ ​ see​ ​ the​ ​ character​ ​ Dido​ ​ holding​ ​ thgolden​ ​ orb​ ​ between​ ​ her​ ​ hands.​ ​ The​ ​ original​ ​ plate​ ​ washot​ ​ with​ ​ a ​ ​ transparent​ ​ orb​ ​ lit​ ​ from​ ​ inside.​ ​ To​ ​ replace​ ​ thpractical​ ​ orb​ ​ by​ ​ the​ ​ CG​ ​ one,​ ​ we​ ​ made​ ​ a ​ ​ matchmove​ ​ of the​ ​ orb​ ​ and​ ​ mattes​ ​ of​ ​ Dido’s​ ​ hands.​ ​ We​ ​ also​ ​ added some​ ​ reflection​ ​ on​ ​ Dido​ ​ for​ ​ better​ ​ integration. - We​ ​ also​ ​ had​ ​ to​ ​ create​ ​ a ​ ​ CG​ ​ asset​ ​ for​ ​ the​ ​ machinery system​ ​ that​ ​ “absorbs”​ ​ the​ ​ orb​ ​ into​ ​ it​ ​ before​ ​ releasing​ ​ it into​ ​ the​ ​ screen.​ ​ Based​ ​ on​ ​ a ​ ​ very​ ​ simple​ ​ sketch​ ​ made​ ​ by Lynch,​ ​ we​ ​ worked​ ​ on​ ​ the​ ​ modeling,​ ​ texturing​ ​ and rendering​ ​ of​ ​ the​ ​ machine.​ ​ The​ ​ animation​ ​ was​ ​ done based​ ​ on​ ​ our​ ​ discussions​ ​ with​ ​ the​ ​ director. - On​ ​ one​ ​ shot,​ ​ we​ ​ also​ ​ have​ ​ a ​ ​ view​ ​ of​ ​ the​ ​ machine​ ​ room, composed​ ​ of​ ​ CG​ ​ machines​ ​ and​ ​ lightning​ ​ FX. It​ ​ was​ ​ an​ ​ exciting​ ​ challenge​ ​ to​ ​ create​ ​ the​ ​ Frogmoth​ ​ : ​ ​ a ​ ​ strange creature​ ​ between​ ​ the​ ​ moth​ ​ and​ ​ the​ ​ frog.​ ​ We​ ​ first​ ​ received​ ​ a drawing​ ​ from​ ​ Lynch​ ​ for​ ​ the​ ​ back​ ​ part​ ​ of​ ​ the​ ​ body. We​ ​ then​ ​ worked​ ​ on​ ​ the​ ​ design​ ​ to​ ​ validate​ ​ the​ ​ look​ ​ with​ ​ the director,​ ​ before​ ​ proceeding​ ​ to​ ​ the​ ​ setup.​ ​ It​ ​ was​ ​ nevertheless​ ​ a continuous​ ​ creative​ ​ process,​ ​ as​ ​ the​ ​ setup​ ​ had​ ​ to​ ​ change​ ​ a ​​ few times​ ​ to​ ​ get​ ​ the​ ​ desired​ ​ shape​ ​ and​ ​ textures. We​ ​ also​ ​ had​ ​ to​ ​ find​​ a ​convenient​ ​ animation​ ​ for​ ​ this​​ imaginary character,​ ​ who​ ​ had​ ​ to​ ​ be​ ​ a ​ ​ nasty​ ​ and​ ​ scary​ ​ animal,​ ​ moving slowly,​ ​ but​ ​ still​ ​ be​ ​ able​ ​ to​ ​ fly​ ​ without​ ​ getting​ ​ comical.​ ​ The​ ​ rigging was​ ​ done​ ​ with​ ​ muscles​ ​ and​ ​ grease.​ ​ We​ ​ also​ ​ added​ ​ some​ ​ hair. 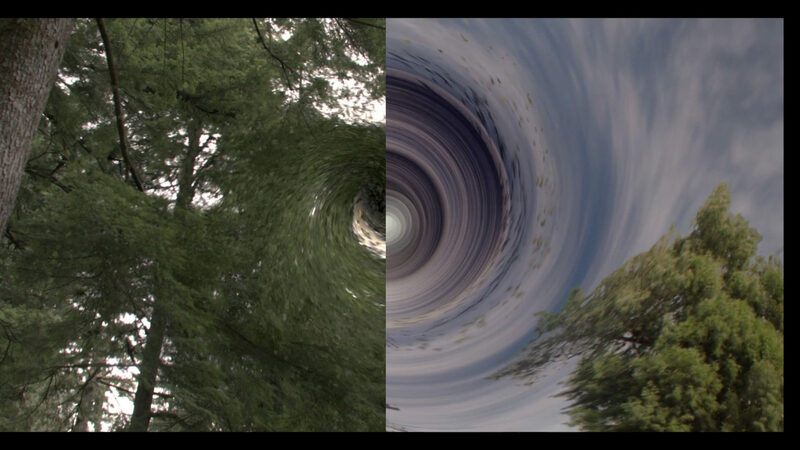 We​ ​ had​ ​ to​ ​ create​ ​ two​ ​ kinds​ ​ of​ ​ imaginary​ ​ “vortex”,​ ​ taking​ ​ us​ ​ into another​ ​ dimension.​ ​ These​ ​ imaginary​ ​ tunnels​ ​ were​ ​ added​ ​ on​ ​ the live​ ​ plates,​ ​ taking​ ​ a ​ ​ part​ ​ of​ ​ the​ ​ surrounding​ ​ elements​ ​ (leaves, clouds...)​ ​ into​ ​ the​ ​ hole. We​ ​ did​ ​ a ​ ​ lot​ ​ of​ ​ tests​ ​ to​ ​ find​ ​ the​ ​ convenient​ effect​ ​ which​ ​ was quite​ ​ abstract​ ​ at​ ​ first. 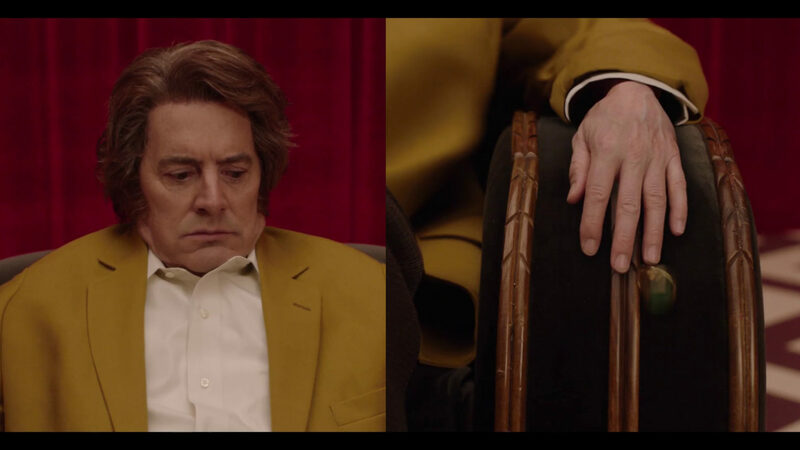 In​ ​ this​ ​ sequence,​ ​ we​ ​ had​ ​ to​ ​ make​ ​ Richard​ ​ character​ ​ disintegrate and​ ​ disappear. For​ ​ each​ ​ shot,​ ​ we​ ​ had​ ​ a ​ ​ plate​ ​ with​ ​ Richard’s​ ​ acting​ ​ and​ ​ another one​ ​ with​ ​ a ​ ​ flare​ ​ created​ ​ by​ ​ a ​ ​ special​ ​ lightning​ ​ machine. The​ ​ flares​ ​ were​ ​ added​ ​ to​ ​ the​ ​ Richard​ ​ plate,​ ​ but​ ​ the​ ​ rays​ ​ were adjusted​ ​ to​ ​ match​ ​ more​ ​ the​ ​ director’s​ ​ vision. 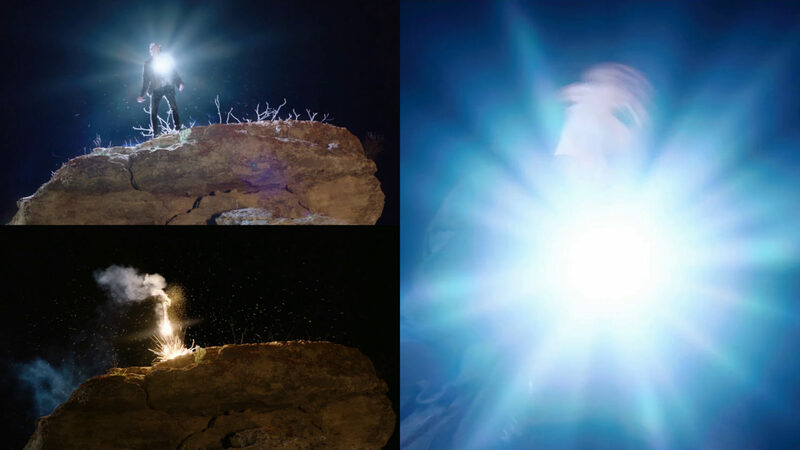 Also​ ​ we​ ​ created​ ​ some​ ​ particle​ ​ FX​ ​ to​ ​ show​ ​ the​ ​ disintegration​ ​ of the​ ​ character​ ​ by​ ​ the​ ​ light. Clean​ ​ plates​ ​ were​ ​ used​ ​ to​ ​ cover​ ​ the​ ​ parts​ ​ where Richard’s​ ​ body was​ ​ already​ ​ disintegrated​ ​ and​ ​ fallen​ ​ into​ ​ particles. 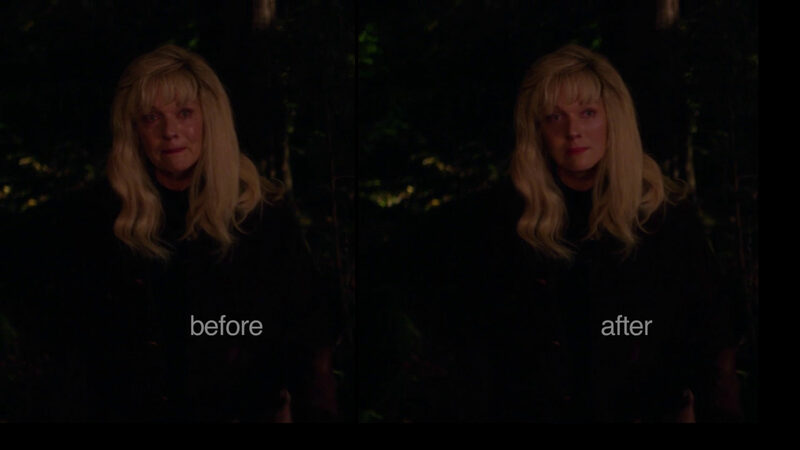 The​ ​ great​ ​ challenge​ ​ of​ ​ these​ ​ shots​ ​ was​ ​ to​ ​ make​ ​ the​ ​ actress Sheryl​ ​ Lee​ ​ look​ ​ 25​ ​ years​ ​ younger,​ ​ in​ ​ order​ ​ to​ ​ match​ ​ the​ ​ footage from​ ​ the​ ​ first​ ​ season.​ ​ It​ ​ was​ ​ quite​ ​ tricky​ ​ to​ ​ find​ ​ an​ ​ effect​ ​ that makes​ ​ her​ ​ naturally​ ​ young,​ ​ and​ ​ does​ ​ not​ ​ look​ ​ like​ ​ a ​ ​ “plastic surgery”. We​ ​ used​ ​ a ​ ​ mixed​ ​ technique​ ​ with​ ​ 2D​ ​ morph​ ​ and​ ​ hand-painted key​ ​ frames​ ​ interpolated​ ​ by​ ​ the​ ​ “optical​ ​ flow”. The​ ​ black​ ​ orb​ ​ had​ ​ to​ ​ be​ ​ a ​ ​ big​ ​ tar-textured​ ​ ball​ ​ with​ ​ Bob character​ ​ inside​ ​ it. We​ ​ first​ ​ made​ ​ some​ ​ researches​ ​ to​ ​ find​ ​ the​ ​ right​ ​ texture​ ​ and transparency​ ​ for​ ​ the​ ​ orb. Then,​ ​ we​ ​ had​ ​ to​ ​ create​ ​ a ​ ​ CG​ ​ Bob​ ​ to​ ​ place​ ​ it​ ​ inside the​ ​ orb.​ ​ As the​ ​ actor​ ​ died​ ​ in​ ​ 1995,​ ​ there​ ​ were​ ​ only​ ​ a ​ ​ few​ ​ reference​ ​ images of​ ​ him​ ​ available.​ ​ We​ ​ could​ ​ only​ ​ use​ ​ some​ ​ very​ ​ limited​ ​ footage from​ ​ the​ ​ first​ ​ seasons​ ​ that​ ​ matched​ ​ the​ ​ desired​ ​ acting. A​ ​ CG​ ​ model​ ​ of​ ​ Bob​ ​ was​ ​ created​ ​ for​ ​ this​ ​ purpose,​ ​ and​ ​ we​ ​used the​ ​ selected​ ​ Bob’s​ ​ images​ ​ to​ ​ help​ ​ the​ ​ texturing. Also​ ​ the​ ​ animation​ ​ had​ ​ to​ ​ be​ ​ very​ ​ specific,​ ​ as​ ​ Bob​ ​ needed​ ​ to​ ​ be screaming​ ​ and​ ​ angry.​ ​ ​ We​ ​ worked​ ​ on​ ​ an​ ​ animatic​ ​ to​ ​ define​ ​ the speed​ ​ and​ ​ the​ ​ trajectory​ ​ which​ ​ had​ ​ to​ ​ show​ ​ us​ ​ the​ ​ violence​ ​ of the​ ​ character. 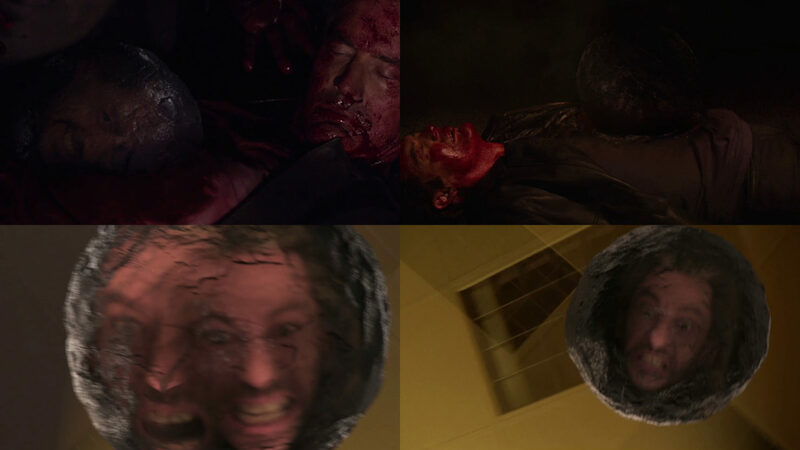 On​ ​ 4 ​ ​ shots,​ ​ we​ ​ also​ ​ made​ ​ the​ ​ CG​ ​ Orb​ ​ come​ ​ out​ ​ of​ ​ Cooper’s body,​ ​ by​ ​ tearing​ ​ apart​ ​ his​ ​ practical​ ​ t-shirt​ ​ and​ ​ adding​ ​ some blood​ ​ textures​ ​ to​ ​ the​ ​ wound.